Hannibal, MO- Hannibal-LaGrange College held their 65th annual Booster Banquet on Friday, November 17. Approximately 850 guests were in attendance, all eager to hear the powerful vocals, as well as the compelling testimony of Gaither Vocal Band lead singer Guy Penrod. Unfortunately, the self described singer, not speaker came down with laryngitis. Not having his vocals to lean on, Penrod had to pull from within, and speak from his heart. You were expecting Gloria Gaither, a beautiful blonde. Instead you got me, her hairy, ugly assistant, he joked, casually leaning against the podium, with a huge, genuine smile across his face. Just sitting next to Guy tonight, I’ve come to appreciate him immensely. What a humble gentleman he is, said Dr. Woodrow Burt, HLG president. Penrod received his bachelor’s degree in music, Bible, and theology from Liberty University. He then took a teaching position at a Christian school in Atlanta, GA, where he taught a music class of 140 junior high schoolers. After retiring from teaching in the early 80’s, Guy moved to Nashville, TN, where he began working as a studio singer. He met Bill Gaither during this time, and the rest, as they say, is history. Since 1994 he’s held the position of Gaither Vocal Band lead singer, and their latest Homecoming video has been on the Billboard Top 40 for seven weeks now. 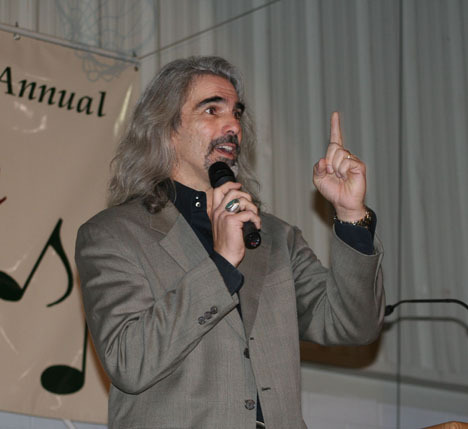 Internationally known for his powerful vocals and broad singing range, his album, The Best of Guy Penrod, reached #92 on the Billboard 200 on August 6, 2005. Penrod’s spirit and energy on-stage, as well as his kindness and sincerity off-stage truly set him apart as more than just a great singer. As a husband to Angie, and a father of 8 children, this accomplished man hopes only to be faithful to the One to which he owes all of his blessings. The holy spirit gave us this ability, the ultimate force which helps us to walk into a room of strangers, and feel like they’re brothers and sisters, said Penrod. The evening also included performances by the Hannibal-LaGrange College Concert Band as well as a special vocal performance by the 2006 HLG Homecoming Queen and King, Megan DeHues and Cameron Beckerdite, accompanied by students Matt Assel and Kathryn Schaefer.